35mm f/1.8 lens, which is a DX lens that works surprisingly well on my FX D750, albeit with some vignetting. I only used this on a couple shots and kept it at f/4 to reign in the dark corners. The session took about an hour, not including some time to set things up and then tear them down at the end, and I think that was probably about the right amount of time to spend. I didn’t want to wear out the baby or his big sister, and the family had other things to do than spend hours upon hours taking directions from a photographer. I had taken hundreds, perhaps thousands, of photos of my own sons when they were infants but had never done a shoot quite like this for someone else so while some of this gear might have been a bit gratuitous I also wanted to make sure I was prepared for anything. I started off with my D750 and 50mm lens which worked quite well, and since we were shooting indoors in the evening I had to use my flash to make sure everything was evenly lit. I almost bought a portable lighting kit for the shoot but I had to find a way of striking a balance between getting pictures and having a practical setup, and a big old softbox or some umbrellas for off-camera strobes just seemed like overkill especially since I was a guest in someone else’s house. One of my favorite tricks when using a speedlight is to bounce it off other surfaces to magnify the impact of the light, and for the picture you see at the top of this post I had the flash pointed straight up which essentially turned the ceiling of the room into one giant light bulb. It worked remarkably well for this as well as almost every other picture from the evening, and if you are interested in learning more about photography but don’t yet have a dedicated external flash I would recommend picking one up. A few times during the evening I switched to the 85mm lens but found that it was a bit overkill and the depth of field was a little too shallow to properly manage without stopping my aperture way down. I wasn’t interested in compressing the background as much as I wanted clear shots of the baby, so mostly I just stuck with my old pal, the classic Nifty Fifty lens. 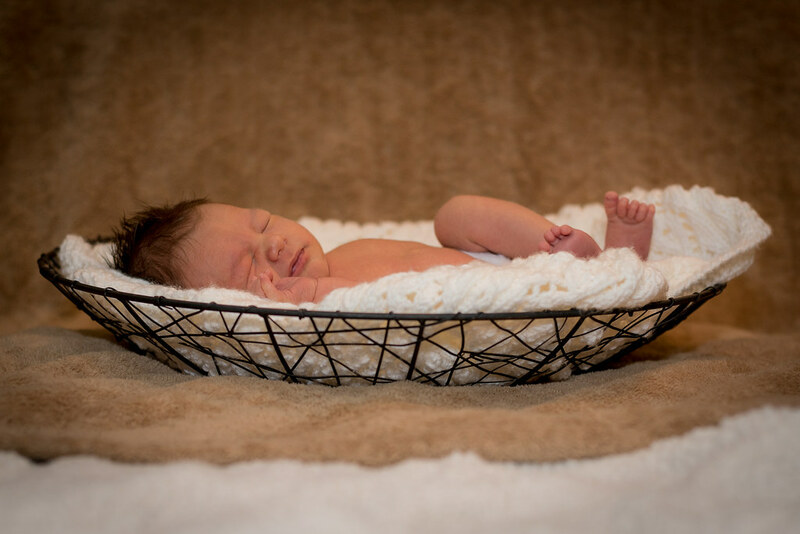 I know it might sound a bit cheesy but the entire session really was a great deal of fun and I thoroughly enjoyed getting the chance to practice my baby photography skills, as this is an area that my wife and I would like to explore more for our side project Stevens Creek Photography. To my friend…if you’re reading this, thank you for having me over and I can hardly believe how much your cute little guy has grown already. I hope you like the pictures as much as I liked taking them! This was probably one of the most “matter of fact”; how-to; and, information packed posts that you have shared with us. From discussion of the equipment you brought and used; what the background consisted of and how it was assembled; to the use of the speedlight bouncing the light off the ceiling. Well done! The picture of the baby is absolutely beautiful. You know that, years from now, the parents will be looking at that photo with great pleasure. I heard what you said about the backdrop towel not being long enough to cover all the area in front of the basket. However, when I first saw the photo, I thought it was planned — note how the white blanket the baby is resting upon matches the white floor(?) that the basket is resting on. f2.8 got you some bokeh and still have the baby in focus. Really good job, Simon. Thank you especially for providing so much useful information on how you went about getting the shot. I appreciate your taking the time and effort to help us. Thank you David, and I’m glad you enjoyed the post. As you know I don’t normally do these types of writeups where I go into such great detail behind the scenes of a photo shoot, but I might do more of them after hearing your response :) It sure was fun taking pictures of this baby and I hope to do more in the future! What an awesome experience! I would like to use my off camera flash more and get more comfortable with it. I have a love/hate relationship with it at times. Picture is very well done. Precious! I love the fact that you practiced with stuffed animals first! And I love your idea for a backdrop. Thanks for sharing these tips. This picture is so beautiful in so many ways! I’m so glad you like it, Marybeth! Everyone before me has said it all. I’ll just add this makes me smile! Such a great post Simon! It just so happens that a friend of mine just asked me to do a photo shoot of their newborn. The only newborns I have ever taken pictures of (since getting my dslr) are my grandsons just a few months ago. So your post is so timely. Great photo! I just read your ow-to-blog piece in DPS and found your blog. I’ll be keeping up. THANKS for the info! Thank you Kat, and I hope you liked that DPS article!